Win bosses, unlock new guns! 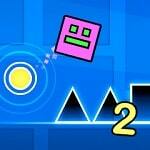 The second part of the game is Geometry Dash, in which the main character goes to the new Neon World. Even more traps of obstacles and dangers heal the player. All actions need to be weeded quickly and clearly, so as not to fall for the trick.